Since becoming a member of the Luxury And Boutique Hotels’ review team, and then becoming their Contributing Editor, I’ve been lucky to stay in some pretty spectacular hotels. While the hotels are all described in more detail in the location-specific section, a quick description and links to the reviews and hotels themselves are below (organized by continent then country). Except the hotels marked *, my stay was hosted by the hotel and/or the tourism commission. However, all views are my own and I do not allow hotels or tourism commissions to review or approve my text. Interested in having your hotel featured on LuxuryAndBoutiqueHotels.com? Please click HERE for more info or contact me at Johanna (@) LuxuryAndBoutiqueHotels.com. Riad Joya: my perfect introduction to Morocco in this elegant and quiet riad (Marrakech medina). Riad Due: Italian and Moroccan hospitality with unique decor (Marrakech medina). Villa des Orangers: the perfect combination of laid-back luxury and service; a Relais & Chateâux hotel (Marrakech Kasbah). La Sultana: opulent and luxe, with a beautiful hammam (Marrakech Kasbah). Dar Housnia: feels like staying in your own riad with your aunt in the kitchen (Marrakech medina). Riad Dar One: roses, a great breakfast and high rooftop views (Marrakech Mellah). The Repose Luxury Riad: a riad in real Moroccan neighbourhood with delicious vegetarian home cooking (Rabat Salé). Villa Diyafa: a high design oasis of luxury, modern and sumptuous; don’t miss the spa or the restaurant (Rabat, embassy district). Karawan Riad: a design-focussed riad by travellers for travellers(Fès medina). La Maison Bleue: one of the original boutique hotels in Morocco (Fès medina). Palais Amani: Amani means wishes or desires, and Palais Amani will grant your desire for a beautiful night’s sleep in an old palace (Fès medina). Dar Roumana: one of the best restaurants in town and one of the friendliest riads (Fès medina). Riad Nùmero 9 and Restaurant Nùmero 7: a restaurant where you can spend the night! (Fès medina). Dar Seffarine: great for solo travellers and other liking delicious communal meals, in a spectacularly restored riad (Fès medina). Riad Tizwa Fès: breakfast on the roof of this family-friendly riad will start your day perfectly, and it will end perfectly cuddled up by your fireplace (Fès medina). Riad Fès, a Relais & Chateâux hotel for when you’re looking for luxury (Fès medina). *Ongava: in a private game reserve near Etosha National Park, you can explore via Landrover or watch the waterhole while sipping sundowners on the veranda. Review. *The Twelve Apostles Hotel and Spa, a family-run hotel affiliated with the luxe Red Carnation group, just outside Cape Town. Review (TravelEater). *Thornybush Game Lodge: in their private reserve on the edge of Kruger National Park, this resort offers twice-daily game drives and excellent dining (plus bathing in your outdoor clawfoot bathtub watched by antelopes and sometimes even elephants!) Review. 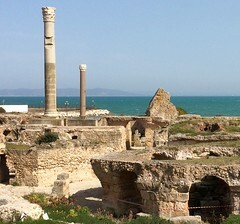 Golden Tulip Carthage: an enclave of exclusivity and security with a fab health spa and hammam and several restaurants to choose from (Gammarth Bay, Tunis). Dar El Marsa: a lovely boutique hotel opposite the beach, with a superb spa and dining, rooftop pool and great service (La Marsa, Tunis). 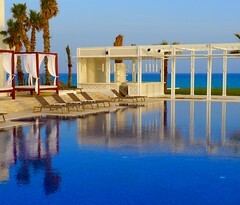 La Badira: an arty Leading Hotel of the World with two of th emost beautiful pools I’ve ever seen (Hammamet). The Orangers Beach Resort: an ultra-exclusive section of the resort will open in 2016, until then you’ll be very happy in your private villa (with butler, of course) next to the soft sand (Hammamet). Gately Inn, a lovely boutique hotel in Entebbe, 10 minutes from Uganda’s main airport, with affable hosts, great food and coffee too. Their sister resort is in Jinja, called Gately on Nile. A great hotel that gives back to the community: Review of Skwachays Lodge, in Vancouver’s Gastown (for LuxuryAndBoutiqueHotels.com). Nita Lake Lodge: A lake-side base for your skiing, golf or mountain biking vacation in Whistler Creekside. Review for LuxuryAndBoutiqueHotels.com. Fairmont Chateau Whistler: A ski-in ski-out resort at the base of Blackcomb Mountain in Whistler Village. Review for LuxuryAndBoutiqueHotels.com. Summit Lodge & Spa Whistler: a boutique hotel which makes you feel happy (and you can foster a betta fish during your stay — hope you’re doing well, Beau!). Review for LuxuryAndBoutiqueHotels.com. Pan Pacific Whistler: two locations with top-notch service. Review for LuxuryAndBoutiqueHotels.com. Nimmo Bay Wilderness Resort. A fly- or boat-in resort near the north of Vancouver Island; one of the Magni7icent Luxury Wilderness Lodges of Canada. Review for LuxuryAndBoutiqueHotels.com and feature for Nanuism. A “glamping” experience with stunning coastal views — review of Rockwater Secret Cove Resort. The Metterra: A small luxury hotel on Edmonton‘s Old Strathcona, voted one of the Top 10 Coolest Neighbourhoods in Canada. Review. The Varscona: a European-style boutique hotel, also in Old Strathcona in Edmonton. Review. Review of Renaissance Nashville Downtown, the modern Renaissance lets you walk to Nashville highlights. Review of Schlitterstein Lofts at Schlitterbahn Waterpark & Resort, consistently voted the best waterpark in the world. Review of The Georges, a stunning boutique hotel in this food-centric college town. Review of the Robert E. Lee Hotel, in downtown Lexington with a great patio and restaurant. Review of Cedarbrook Lodge, an almost-wilderness lodge in lovely Seattle Southside near SeaTac airport. And it has amazing treats! Review of The Osthoff, in Elkhart Lake. Review of The Edgewater, on the lake in Madison. Palo Verde Sustainable Hotel, in EL Zonte, for Luxury and Boutique Hotels. Boutique Hotel Café Cultura: A hacienda style hotel filled with roses in Quito. Review for LuxuryAndBoutiqueHotels.com. Mansión del Angel: Feel like you’re in a Venetian palace in this boutique hotel near Quito’s historic centre. Review for LuxuryAndBoutiqueHotels.com. Swisshôtel Quito: A modern hotel with a fantastic spa in the business district of Quito. Review for LuxuryAndBoutiqueHotels.com. Casa Gangotena: The most luxurious hotel in Quito, right in Plaza San Francisco. Review for LuxuryAndBoutiqueHotels.com. Luna Runtun Adventure Spa: A boutique hotel on the side of a volcano, with hot pools overlooking the pretty town of Baños. Review for LuxuryAndBoutiqueHotels.com. Destiny Hotel: A modern place to relax after seeing the waterfalls and zip lines around Baños. Review for LuxuryAndBoutiqueHotels.com. Haugan Cruises: A top luxury pick for seeing the Galápagos Islands. Review for LuxuryAndBoutiqueHotels.com. Hotel Solymar: A seaside hotel with a fantastic chef in Puerto Ayora, Isla Santa Cruz. Review for LuxuryAndBoutiqueHotels.com. Torre Mar Luxury Vacation Rentals. If you want a longer stay in an apartment or villa in Puerto Ayora, Isla Santa Cruz. Review for LuxuryAndBoutiqueHotels.com. Royal Palm Hotel: Galapagos’ only 5 star hotel and member of The Leading Hotels of the World. And it has its own lava tunnel! In the highlands of Isla Santa Cruz. Review for LuxuryAndBoutiqueHotels.com. Finch Bay Eco Hotel: A quiet resort with a beach and a pool, just three minutes from Puerto Ayora on Isla Santa Cruz. Review for LuxuryAndBoutiqueHotels.com. Iguana Crossing Boutique Hotel: spectacular views of the white sand beaches of Isla Isabela, and the place to stay if you dream of having sealions play with you while you snorkel. Review for LuxuryAndBoutiqueHotels.com. Sumaq Machu Picchu: an ideal base in Aguas Callientes for your Machu Picchu trip, but leave time for your ceviché and pisco sour cooking lessons! Review for LuxuryAndBoutiqueHotels.com. Tambo del Inka (Urubamba, Sacred Valley): A spectacular hotel (and a member of Starwood’s Luxury Collection) in the Sacred Valley, with its own train station to Aguas Callientes and Machu Picchu. Review for LuxuryAndBoutiqueHotels.com. El Mercado Tunqui: a cozy boutique hotel with exceptional service in Cuzco. Review for LuxuryAndBoutiqueHotels.com. Andean Wings Boutique Hotel: A wide variety of rooms and suites (some with jacuzzis!) in Cuzco. Review for LuxuryAndBoutiqueHotels.com. Encantada Casa Boutique Spa Hotel: Beautiful views down on to historic Cuzco from this boutique hotel with a new spa on the way. Review for LuxuryAndBoutiqueHotels.com. Taypikala: Stay right on the edge of Lake Titicaca, the highest navigable lake in the world. Review for LuxuryAndBoutiqueHotels.com. Casa Inca Boutique Hotel: A historic former residence near the cliffs in Miraflores, Lima. Review for LuxuryAndBoutiqueHotels.com. Heritage Suites Hotel: on LuxuryAndBoutiqueHotel.com’s top 8 worldwide hotels list because it creates the perfect atmosphere to make guests feel wonderful in all respects. Affiliated with Relais & Châteaux. Review for LuxuryAndBoutiqueHotels.com. Pavillon d’Orient Hotel: a pretty little boutique hotel on the outskirts of Siem Reap, with tuktuk transportation included. Review for LuxuryAndBoutiqueHotels.com. Park Hyatt Siem Reap: big-city luxury in Siem Reap, plus impressive support to organizations helping to rebuild Cambodia. Review for LuxuryAndBoutiqueHotels.com. The RiverGarden Hotel: a small boutique with an excellent kitchen, cooking school and street food tour. Review for LuxuryAndBoutiqueHotels.com. Sojourn Boutique Villas: a villa resort just outside of Siem Reap in a tiny village; Sojourn’s owners do more than most other hotels combined to help the local community. A destination spa and cooking school too! This hotel near Siem Reap is good for locals (for The Wayward Post). Amansara: while they were too full to host my stay, I got to experience their restaurants, spa, several activities and toured the resort. This is the most exclusive place to stay in Siem Reap. More. Angkor Miracle Resort and Spa: a big resort on the road to the airport with a giant pool; very popular with groups. Review for LuxuryAndBoutiqueHotels.com. The One Hotel Collection. Three micro hotels: the three-room Hotel Be and one-room The One Hotel, both off Pub Street (but surprisingly quiet), and The One Villa Angkor, just outside town. Review for LuxuryAndBoutiqueHotels.com. Review of the Yibin Crowne Plaza in Sichuan province: the only five-star urban hotel in Yibin, a great business and conference hotel, and not too far from sites like the Stone Sea, the Bamboo Sea, and the biggest open-to-the-public cave in China (for LuxuryAndBoutiqueHotels.com). “How long should I stay in Luang Prabang, Laos?” including a chart to help you pick the right hotel for you. 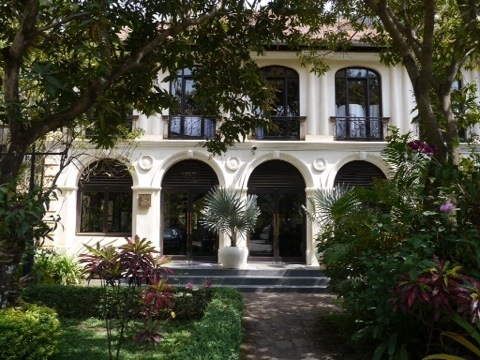 Hôtel de la Paix: the most luxurious of all the LuangPrabang hotels I stayed in. More information in “Beyond the monks and the mountain” (NewJetsetters.com). The 3 Nagas: sister to Hôtel de la Paix and with the best food in town. Review for LuxuryAndBoutiqueHotels.com. Mekong Riverview: a boutique hotel that has thought of everything for guests’ ease and comfort. Review for LuxuryAndBoutiqueHotels.com. Villa Maly: a very French hotel just outside the UNESCO zone with a pool. Review for LuxuryAndBoutiqueHotels.com. Le Sen Boutique Hotel: modern minimalist with all the conveniences, including a pool and a gym. Review for LuxuryAndBoutiqueHotels.com. Apsara Rive Droite: on the opposite bank from the UNESCO zone via a two-minute ride in the Apsarian Queen. Review for LuxuryAndBoutiqueHotels.com. Villa Sungai: in a real Balinese village in the south of Bali, Villa Sungai is one of the finest hotels in the world. It won Luxury Travel Magazine’s 2013 best overseas boutique property and is one of LuxuryAndBoutiqueHotels.com’s top 8 worldwide hotels. This luxe and discrete resort can be thought of as two private homes, Villa Sungai and Sungai Gold. You can book the entire resort or just half. Review for Luxury Travelers Guide. Chapung SeBali: just outside of Ubud near the village of SeBali, this luxe eight-suite villa hotel features immense villas with private pools. Review for LuxuryAndBoutiqueHotels.com. Mahagiri Villas: in the eastern town of Sanur, a villa hotel designed for privacy — have breakfast delivered to eat beside your private pool! Review for LuxuryAndBoutiqueHotels.com. Pondok Ayu: also in Sanur, a five-room boutique hotel very popular with families and returning guests. Review for LuxuryAndBoutiqueHotels.com. Villa Kresna: in a quiet spot (two in fact — there are separate hotel and villa locations) near the beach in busy Seminyak. Review for LuxuryAndBoutiqueHotels.com. Wilson’s Retreat: A top notch boutique hotel on the quietest part of Gili T, plus fantastic food. Review for LuxuryAndBoutiqueHotels.com. Hotel Ombak Sunset: Best sunsets on the island at a wide beach; while the water is too shallow for swimming, the hotel makes up for it with the biggest pool on the island. Review for LuxuryAndBoutiqueHotels.com. Villa Grasia: A small boutique hotel great for families. Great snorkelling offshore. Review for LuxuryAndBoutiqueHotels.com. The Danna Langkawi: luxurious colonial style with phenomenal customer service (and the biggest pool on the island). Review for LuxuryAndBoutiqueHotels.com. Ambong Ambong Rainforest Retreat: a zen hotel up a hill from a quiet beach; they deliver breakfast to your fridge the night before so you are undisturbed. Review for LuxuryAndBoutiqueHotels.com. Rebak Island (Vivanta by Taj Hotels): on a private island just off Langkawi (near the airport), this resort is the tropical version of the Fairmont Jasper Park Lodge in the Canadian Rockies. Review for LuxuryAndBoutiqueHotels.com. Bon Ton and Temple Tree: these sister boutique hotels are affiliated with the LASSie animal shelter, and have many (healthy) canine and feline residents to hang out with. Review for LuxuryAndBoutiqueHotels.com. Villa Molek: a tranquil boutique hotel a short walk from popular Pantai Cenang. Review for LuxuryAndBoutiqueHotels.com. Hotel Penaga: an arty and environmental hotel in George Town with a pool. Review for LuxuryAndBoutiqueHotels.com. For The Wayward Post, Stay in this sustainable boutique hotel in Penang, Malaysia, about Hotel Penaga. 23LoveLane: in George Town‘s UNESCO-zone, 23LoveLane was brought from near-ruin to heritage boutique status thanks to a thorough conservation project. Review for LuxuryAndBoutiqueHotels.com. PARKROYAL Penang Resort: a great resort for families (it has waterslides!) on Batu Ferringhi (Foreigner’s Rock)’s golden beach. Review for LuxuryAndBoutiqueHotels.com. Review of Hotel G Singapore. Review of Park Hotel Farrer Park. De Lanna Boutique Hotel: right in the centre of the old city of Chiang Mai, but still quiet. Review for LuxuryAndBoutiqueHotels.com. *Hotel Novotel Bangkok Suvarnabhumi Airport. Right at the Suvarnabhumi airport (the main airport for regular (non-budget) carriers) this Novotel is much more luxurious than your normal Novotel. Check-in is at any time and check-out 24 hours later. “Bangkok: A feast for the senses” (originally published on CheapOAir). Another luxury cruise line that sails around the world on its one motor sailing yacht and additional super yachts: Ponant Cruise, for New Jetsetters. We’ve been to many of the hotels you recommend and we agree with what you say about them. We’ll be back to see where you have been when we plan our next trip! Great – glad I could help! Have a favourite?